Known as “The Mother Church of Saint Petersburg,” Saint Mary has long been recognized as an architectural wonder, with scholars coming from all over the country to study its distinctive features. The grand stone structure stands magnificently on the southern edge of the beautiful city of Saint Petersburg, a landmark easily remembered by visitors. Father O’Riordan, the first Pastor, envisioned a church constructed on the pattern of San Stefano in Rome, which enchanted him when he studied there for the priesthood. It was a round building in which the altar was the central, spiritual, and architectural focus. This design would allow a large number of worshipers to be near the altar where they could both hear and see well, and feel physically very close to the service. Architect Henry Taylor was selected to design the project along with Fr. O’Riordan. Mr. Taylor had designed several prominent buildings in Saint Petersburg. Fr. O’Riordan purchased a parcel of land measuring 200’ x 210’ at the corner of Fourth Street and Fifth Avenue South in 1928. This location was the geographic center of the city and seemed to be an excellent site for the church that would serve Saint Petersburg. It was here that the current Saint Mary’s Church would be built. The land Fr. O’Riordan purchased was a rather small parcel. The traditional nave church would not have been an appropriate design because the lot was too small. The building would need to seat a large congregation, as many as 1,000 people. The unusual octagonal design of Saint Mary was the result of collaboration between Henry Taylor and Fr. O’Riordan when it was realized that this design made the best use of the available land space to maximize the seating capacity of the building. Construction of the present church began in 1929. DuBois & Hennessy, a local contracting company, was selected to construct the church. The church is Byzantine in style with some Romanesque features. The church’s foundation and walls are made of two-foot thick solid brick. Underneath the decorative wood, the roof trusses are of solid steel. As you walk around the outside of the church and study the beautiful brick work, look at the gargoyles and the carved columns. Think of the hard labor it took to lay all the brick. Examine the exquisite stone carving of the Three Magi above the main entrance, this event carved in a single piece of refined rock made by Ruckland Stone of Alabama. Open the massive doors and come inside. Feel the serenity that comes from its solid structure. As the light streams through the sixty-one stained glass windows, one cannot help but feel a very special presence and sense of reverence. The building has seven balconies, numerous grand archways, and marble floors. Saint Mary is indeed a very exceptional place which has provided a wonderful sanctuary for all the religious purposes for which it was intended. Because of its unique splendor, the church has been popular throughout its history for the celebration of weddings. Many area residents have married here and know relatives or friends who have professed their marriage vows here. A little red brick building stands at the entrance to the municipal pier in the city on the shore of Tampa Bay. With its title, “Comfort Station,” etched in concrete, it is a public restroom owned and maintained by the City of Saint Petersburg. Since it bears a striking resemblance to Saint Mary, it has acquired to nickname, “Little Saint Mary’s”. There is a likeness between the two buildings. They are each built on lots that are small in relation to their size. They are both octagonal in shape and they have the same roof lines and brick work. Stories about the two look-alikes surface around the city. One of the most popular is that the architect of Saint Mary’s was not paid for his work on the church, so in spite he designed the restroom to embarrass the church. 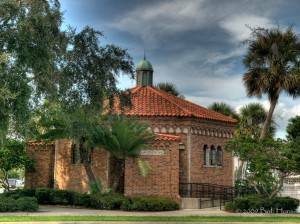 restroom was built for the city two years before Saint Mary’s constructed its church. Because difficulties are inherent in creating an eight-sided building, Mr. Taylor designed the comfort station as a prototype. Built in 1927, it was used as a model for the church which was built in 1929. On September 11, 1892, also the feast of the Most Holy Name of the Virgin Mary, the first known and recorded Mass on the lower Pinellas peninsula was celebrated at the Hotel San Jose in the area of Saint Petersburg now known as Driftwood. The area was served by the Jesuits of Sacred Heart, Tampa. 1892-1920. 1907 The first Saint Mary's, a wooden structure, was erected at the Northwest corner of Sixth Street and Fifth Avenue South. 1909 Construction started at 2nd location of Saint Mary's, Fourth Street and Third Avenue South. On November 21, 1920, Fr. James J. O'Riordan, STL of the Diocese of Saint Augustine was the first secular priest assigned to Saint Mary's. He studied for the priesthood in Ireland. He also studied for four years at the North American College in Rome where he received a degree in sacred theology. In 1922 Fr. 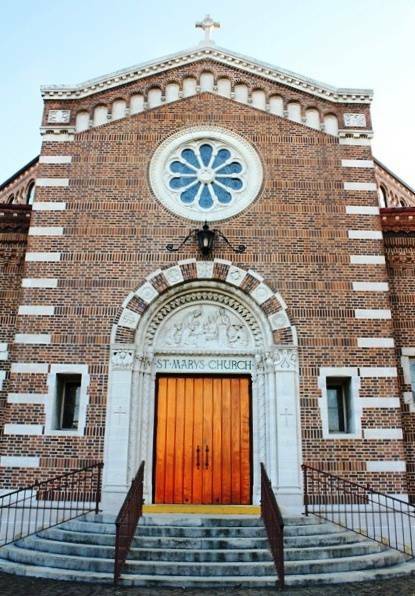 O'Riordan purchased ten acres of land at 12th Street and 18th Avenue North for $9,500 and built Saint Paul's Church in 1925 in the Roman style. In 1926he purchased ten lots on 22nd Avenue South for $2000 and built Saint Joseph's in the Florentine style. Both Churches were constructed from the monies of Saint Mary. 1922 Saint Mary is canonically accepted. 1929 Construction started on the present Saint Mary's. It is Byzantine in style with some Romanesque features. It was styled after San Stefano's Church in Rome. Initial building costs were $129,000.00. Saint Mary's is octagonal with brick exterior and a clay tile roof. The property measures 200' x 210' and in 1928 was purchased from the estate of General John C. Williams, a founding father of Saint Petersburg. January 26, 1930 Conerstone laid by Bishop Patrick Barry. Major renovations occurred in 1955, 1968, 1995 and 2004.